CW Auxiliary Thrift Shop, "Still Fabulous"
There are many more volunteer opportunities available during weekdays. If your free time is primarily on weekends or evenings - please be patient. You will be interviewed individually by a coordinator of volunteers. We will discuss with you possible areas of placement and an outline of services requirements at this time. If accepted to the program you must attend an orientation/ training session. BC Women’s Hospital & Health Centre, BC Children's Hospital and the Sunny Hill Health Centre for Children are fortunate to have many individuals who are interested in volunteering. If we have not been in touch with you within six months, please contact volunteer@cw.bc.ca to update your application. We provide volunteer support for BC Children's Hospital and Sunny Hill Health Centre for Children. Our department is responsible for the recruitment, selection, and assignment of volunteers for a variety of patient and service-based areas within these facilities. 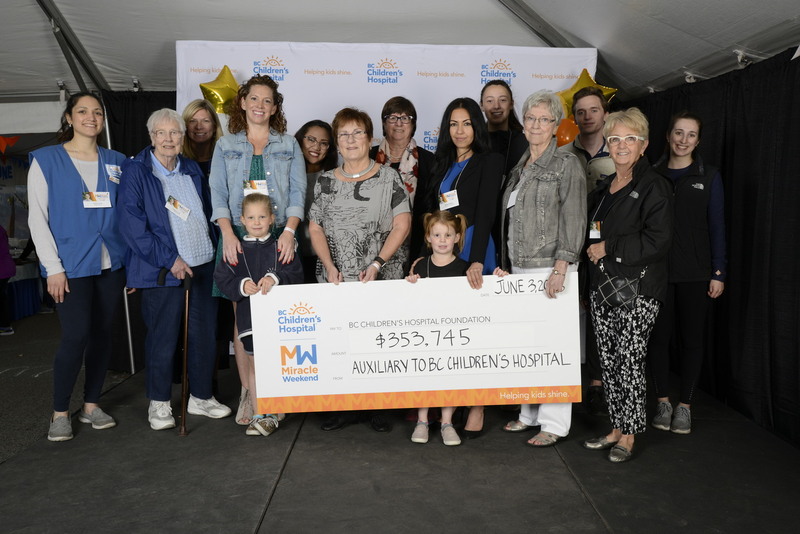 The Auxiliary to BC Children's Hospital is a separately incorporated provincial society and federally registered charity which supports patients and their families at BC Children's Hospital & Health Centre. Carrying out such activities as may be requested. The Auxiliary is a self-governing, non-profit society, membership organization that is accountable directly to the hospital. The Auxiliary was founded by persons from the community who agreed to work together to assist our health care institution in promoting the health and welfare of the community. The department of Volunteer Resources and the Auxiliary have specific and separate roles and responsibilities based on mutual support. The Auxiliary Board of Directors liaises with the department of Volunteer Resources. Auxiliaries and volunteers represent a unique and valuable human resource to health care institutions. It is important that these relationships, responsibilities and accountabilities be clearly defined and understood by all parties involved. Clarification of functions and relationships is necessary to maximize the contributions of auxiliaries and in-service volunteers for the benefit to both the institution and the community. If you would like more information on volunteering, please view our Online Application. The Auxiliary to BC Children's Hospital operates an on-site gift shop in the lobby of BC Children's Hospital. All proceeds are directed toward enhancing patient care. The gift shop is open seven days a week and carries a wide variety of items including snacks, plush toys, games, reading materials and a wide variety of logo wear. Phone orders and in-hospital delivery are available, please call the gift shop for further information: 604-875-2000 local 7219. In the main lobby of BC Children's Hospital. The purpose of Still Fabulous is to raise funds for services, programs, and equipment for both hospitals. Still Fabulous specializes in high-quality clothing (women, men, and children), accessories, toys and jewellery. Please visit the Holiday Card Program website for more details. In 2006 the Auxiliary to BC Children's Hospital and Salvation Army National Recycling Organization formed a unique social enterprise partnership with the purpose of raising funds for both organizations. Proceeds are shared between the non-profit organizations to benefit those in need. Today the Auxiliary and Salvation Army enjoy a collaborative relationship; working together to support their common goals. For more information, please visit the Auxiliary to BC Children's Hospital website.